In this episode, I chat with the founder of the Winward Academy, Dr. Jennifer Winward. 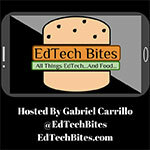 We discuss how virtual tutoring has transformed how and when students learn. She's a San Diego native as well and listen to hear what she has to say about her favorite cuisine from her worldwide travels, including flour vs. corn tortillas. Don't forget to tell a friend, subscribe, and leave a review on iTunes, Google Play, or whatever podcast platform you get your podcast from. Buen Provecho!